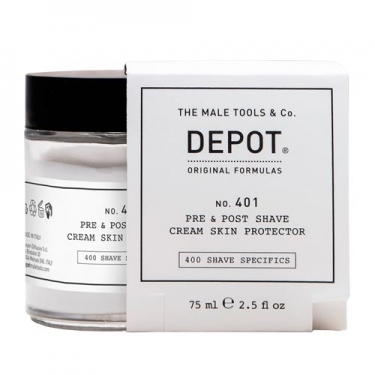 DESCRIPTION: Nº 401 Pre & Post Shave Cream Skin Protector from Depot is a protective cream to use before and after shaving. It prepares, preserves and protects the skin before shaving. It can also be used as an after shave product thanks to its emollient, soothing and refreshing action. Contains in its formulation: Olive oil, emollient, nourishing and skin conditioner; Sweet almond oil, soothing, nourishing and skin conditioner; Eucalyptus essential oil, perfuming and skin conditioner; Glycerin, moisturizer, supports the level of hydration of the skin, keeping it soft and elastic. Ideal for all skin types, even the most sensitive and for all types of beards. Apply to the skin before or after shaving and massage.